This workshop will explore trapeze and aerial hoop choreography with a focus on music. As a musician in addition to an aerialist, Eliana has an innate awareness of how to use music to define movement. We will learn to analyze different components of music and will work with one or more pieces of music that have complex time signatures. We will then learn a small piece of choreography that uses music as its main source of movement. Finally, students will have the opportunity to experiment with their own choreography or ambient performance by using music as inspiration for their movement. *Please note: A previous knowledge of at least 10–15 moves on hoop or trapeze is strongly encouraged. A previously developed ability to analyze music is not required – this we will learn in the workshop. Information about the teacher: Eliana was born and raised on North America’s West Coast. She began exercising her physical creativity as a child through recreational gymnastics. She soon made the smooth transition to circus by joining a youth performance troupe, where she developed an aptitude for bar-based aerials. She continued her professional training in the USA, Canada, and Denmark. Between 2012 and 2018, Eliana performed as an independent aerialist in Vancouver, Canada including with the nationally renowned company The Underground Circus. 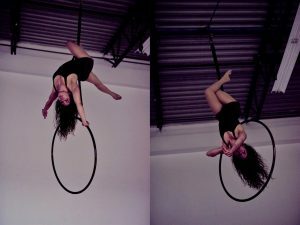 Eliana also has more than eight years of experience coaching aerial hoop and trapeze. Until her move away from Vancouver in early 2018, she held the position of Head Hoop and Trapeze Coach at CircusWest Performing Arts Society. For the past year, Eliana has been participating in artist residencies in Finland and Germany, launching new artistic projects and musical collaborations, and teaching circus wherever she goes. She is currently based in Leipzig, Germany, where she is a resident artist at the Pilotenkueche International Art Program and is teaching trapeze at Artistenkombinat Leipzig e.V. In addition to a circus artist, Eliana is also a conceptual visual artist and a classically-trained singer. She holds a BA in Visual Arts (with a focus in printmaking) and Indigenous and Western Art History from the University of British Columbia, and she has launched genre-fusing collaborative music projects in Vancouver and in Berlin. Eliana is a recipient of the British Columbia Arts Council’s Early Career Development Program Award (2018). Please visit www.eliana-sofia.com for more information, images, and footage.